Really, all you need to clean your windshield is a glass of water. 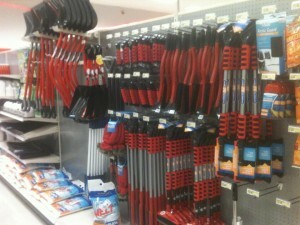 I appreciate your optimism, Target, but I just don’t think we need a whole aisle of snow shovels in Texas. Especially since I’m still wearing shorts. — Reid Kerr hopes this is one of those “every four years” when Texas actually gets snow, but he ain’t betting on it. This entry was posted on Tuesday, November 6th, 2012 at 4:51 pm	and is filed under Musings. The entry is tagged under You can follow any responses to this entry through the RSS 2.0 feed. You can skip to the end and leave a response. Pinging is currently not allowed.